LinkedIn cofounder and Greylock partner Reid Hoffman in conversation with CHM CEO Dan’l Lewin. Silicon Valley is home to a disproportionate number of companies that have grown from garage startups into global giants. But what is the secret to this extraordinary success? Conventional wisdom attributes it to the Valley’s concentration of engineers and entrepreneurs, lots of available capital, and a culture comfortable with risk-taking. But, says Reid Hoffman, cofounder of LinkedIn and partner at venture capital firm Greylock, the updated version of that narrative is that Silicon Valley, a “collective learning network,” has figured out that growing fast is more important than being first. 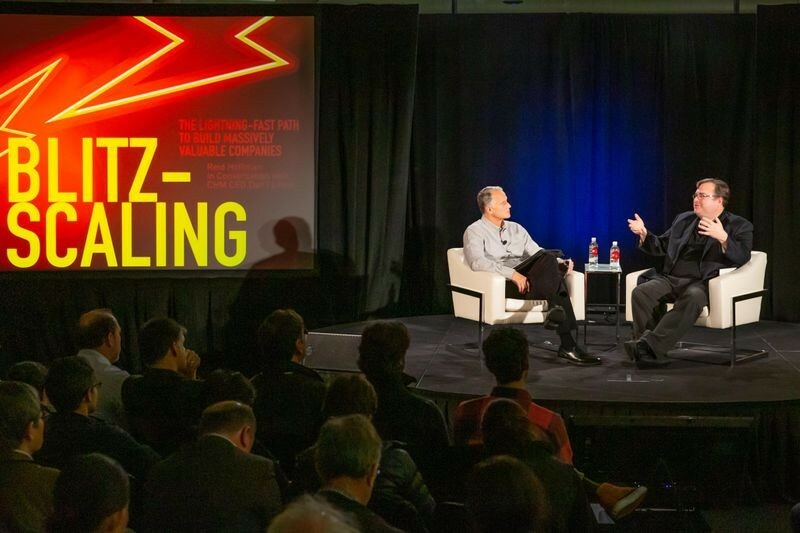 Hoffman was at the Computer History Museum (CHM) on December 4, 2018, to discuss the new book he co-wrote with Chris Yeh to describe this practice, Blitzscaling: The Lightning-Fast Path to Building Massively Valuable Companies. Blitzscaling, explains Hoffman, is a specific set of activities that prioritizes speed over efficiency in an environment of uncertainty and allows a company to go from “startup” to “scaleup” at a pace that captures the market. The uncertainty comes in because founders are spending money and hiring staff before they may fully understand the business model or the market. But, he argues, this is necessary because in today’s world there are more and markets where only the first and biggest player wins, particularly in tech-dependent enterprises. He was driven to write the book, which distills the lessons from his Stanford class on entrepreneurship, to share with other innovative cities who hope to emulate Silicon Valley. Moderator Dan’l Lewin, CEO of CHM, asked a variety of provocative questions to capture the concept of blitzscaling and its implications. The roots of the idea lie in Hoffman’s own experience observing the dot com boom and bust of the late 1990s and early 2000s, being an entrepreneur himself, and participating in the exponential growth of PayPal even before it had a business model. There, he came to one of the many counterintuitive tenets of blitzscaling: sometimes you have to ignore your customer. You do so in order to devote your resources to scaling the product quickly so you can serve millions more future customers. Hoffman vividly described the messy way this played out at PayPal. In addition to lessons like ignoring your customer, Hoffman also shared thoughts on which companies can and should blitzscale; he says speed is relative and companies that will probably benefit most are those that rely most heavily on technology. But, examples like Zara, the fashion retailer, demonstrate that blitzscaling can happen outside of tech, and examples like Microsoft, show that blitzscaling can happen within huge corporations. In all cases, blitzscalers need to be smart about what they are doing, bring their boards along with them by making a strong case for why it is necessary, and ensure that adding capital infusions doesn’t just result in “fake” growth by using metrics to explore where and how funds are applied. Entrepreneurs, says Hoffman, must embrace chaos, learn fast, be flexible, make quick decisions, and always ask for honest truth-telling from people who won’t just tell you what you want to hear. Reid Hoffman’s advice to entrepreneurs. Continuous learning is key to the concept of blitzscaling. Not only is it important to be flexible and open when an environment is uncertain, but it also promotes a mindset that is critical for responsible growth. Hoffman and Lewin discussed important questions about the ethics of blitzscaling public companies and nonprofits in areas like finance and healthcare that have the potential to seriously impact people’s livelihoods and, literally, their lives. Reid Hoffman considers ethics and risks. Concerns about ethics, risk, and impact are particularly relevant in today’s climate of what Hoffman calls, “techlash,” or the backlash against major tech companies with global impact that perhaps have not operated with the accountability and openness that people expect. One way to address the issue is to get company culture right from the beginning, Hoffman insists, define it explicitly in relation to the mission and make it public as a part of the brand. As his one word of advice to aspiring entrepreneurs, Hoffman chose “Learn,” bringing home the point that in the chaos and uncertainty of the entrepreneurial journey, and in the context of transformative technologies and blitzscaling companies, it is the most essential skill. In his role as a venture capitalist, Hoffman asks founders, “What's an important achievement? What would you tell your younger self.” He is looking for explicit learners, those who have absorbed the lessons of their experiences so well that they can teach it to others and become, like Silicon Valley itself, a part of the collective learning network that can help solve big challenges . . . fast. “Blitzscaling: The Lightning-Fast Path to Building Massively Valuable Companies—Reid Hoffman in Conversation with CHM CEO Dan’l Lewin,” December 4, 2018. This event is produced by the Exponential Center at the Computer History Museum.